No doubt you’ll be taking photos on your smartphone —and sharing your photos with family and friends. Have some fun with your photography this year by employing these tips and tricks from Seán Duggan, author of The Enthusiast’s Guide to iPhone Photography. It’s hard escaping social media in the everyday landscape of our lives. For many it provides an important way to keep in touch, not only with friends and family but also with the larger community spheres that you are a part of in your local area. 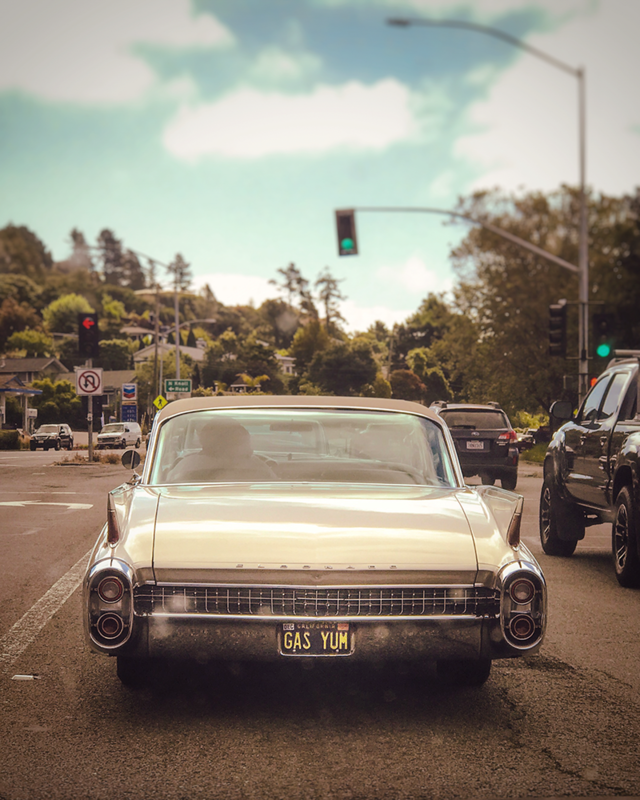 Social media is an onramp to connecting your photographs with a global audience. There are many social media platforms or channels available. In this section we’ll take a quick look at some of the more omnipresent contenders. The 800-pound (or perhaps much heavier than that!) gorilla on the social media photo scene is Instagram. The mechanics of Instagram are pretty basic: share your images, perhaps apply some adjustments or filters using the in-app editing features, add hashtags to make them more visible to the wider Instagram community, follow and comment on other people’s images, and grow your Instagram stream. If you’re new to Instagram, then your stream of followers and those you follow may be focused on people you know, or photographers you admire. If you want to keep your Instagram circle close and carefully curated, you can always choose to have a private account that allows you to approve the people who follow you.The default image format with Instagram is a square. When you tap the plus to add a new image it will always show it with a square crop, but you can tap the small expand icon in the lower left to show the full image with no cropping (Figure 1). In addition to sharing your images in your Instagram feed, you can also post images and video to Instagram Stories, which are visible for only 24 hours after you post them. This can be a fun way to chronicle the events of a day or a trip in a way that feels more immediate. However, it’s also more raw and ephemeral. Because you are posting updates of a work in progress (i.e., whatever you happen to be doing that day), there is less of a sense that the image or video needs to feel finished or be perfect. You can also add text labels, tag other people with their Instagram names, or even add a survey where viewers can respond to a specific question (Figure 2). In keeping with its “current events” theme, in the first view of your photos after you begin or add to a story, Instagram Stories will only show you images in your Camera Roll from the past 24 hours. Swipe vertically on the thumbnails and you will eventually move beyond this time period and into the Camera Roll. To access photos in any of your albums, tap on the location header (e.g., Last 24 Hours or Camera Roll). 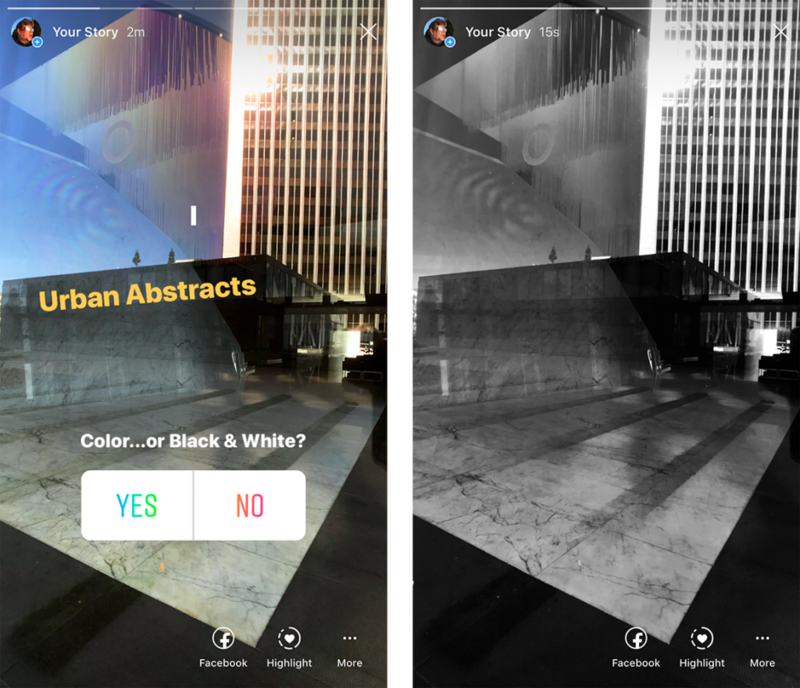 Keep in mind that Instagram Stories are designed to be presented in a vertical format, though recent modifications to the app will now show horizontal images against a field of color sampled from the photo. Later in this chapter, in the section on jazzing up your posts, we’ll explore some apps that let you add design templates to your Instagram Stories. Share Your Photos on Facebook Instagram may be a large gorilla in the social media photo landscape, but so is Facebook. In addition to posting updates describing the latest happenings in your day, you can also post individual images to your stream. You can also organize groups of photos into specific albums. As with Instagram, you can share images to Facebook directly from the Photos app by tapping the Share/Export button below the image (Figure 3), or above if you’re viewing it horizontally. As with Instagram (and any social media app), you can also choose a photo for a post from within the Facebook app. Sharing to Facebook is a great way to access the followers you already have—either people you know in your immediate social or professional network, or to followers of your business or professional Facebook page. 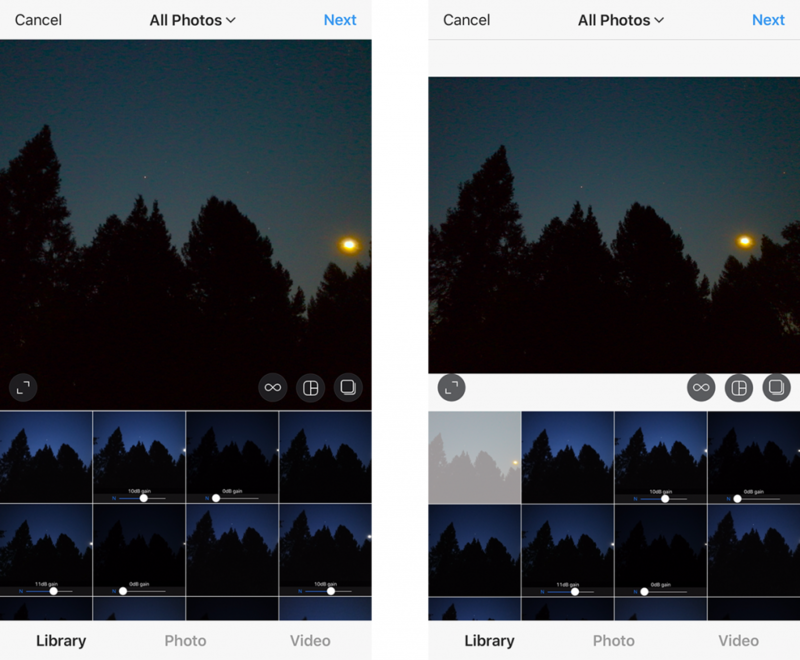 1 The Instagram default format is a square. After selecting an image, tap the expand button in the lower left corner of the image preview to show it without a square crop. 2 Two pages of an Instagram Story. The first features a title and a poll question that viewers can respond to. 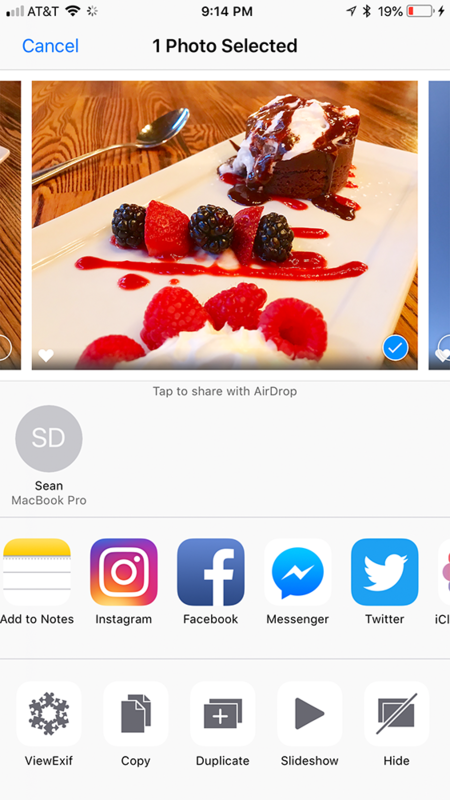 3 You can share to Facebook from within the Photos app or from within the Facebook iOS app. Twitter is a bit of a different beast than Instagram or Facebook simply because of the limit of what you can add to your post. As well, the sheer volume of posts on the app can quickly push your post down “below the fold.” Depending on your number of followers, and how many people they are following, your post may be a flash in the pan in their Twitter feeds, a momentary impression that is quickly lost to the ever-updated flow of the Twitter stream. But, as you build your network of followers, you’ll be able to reach the people who follow you with regular posts. A good way to expand the reach of what you can say on Twitter (currently limited to 240 characters) is to first make your post in some other medium or platform, such as an Instagram or a Facebook post, where you have more room to say all that you want to say. Then include a link to that longer post within your Twitter post. I typically post an image and the first sentence or two of a longer post, then add a link to it in the Twitter post. 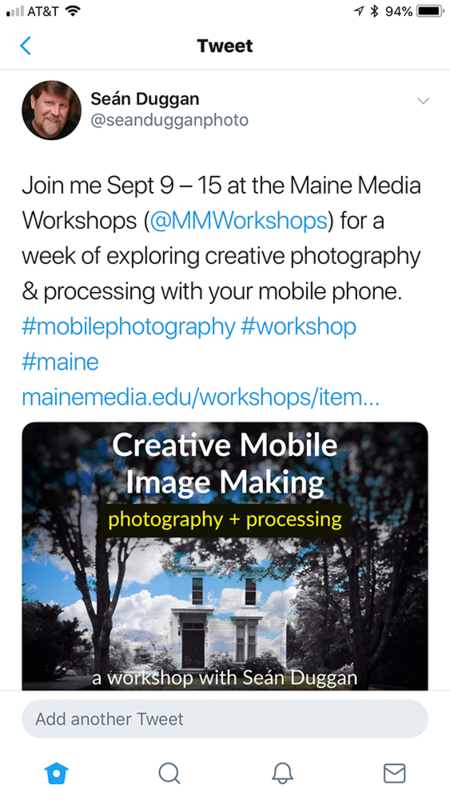 I will also sometimes post an image and a link to something that I am promoting, such as a mobile photography workshop or a new episode of my LinkedIn Learning series “Mobile Photography Weekly” (Figure 4). 4 This Twitter post (tweet) includes a photo and a link to another social media platform or website with additional information. As mentioned earlier Instagram has a very large footprint in the social media photosharing world, but there are alternatives to explore if you want to reach a different audience. One of those is EyeEm, a sharing platform that is similar to Instagram but without so many cute cat videos and puppy photos (not that there is anything wrong with such subject matter!). EyeEm features regular “missions,” contests where you can enter photos that interpret a certain theme for a chance to win prizes or have your photos featured. It also offers the option to license your images for sale on its internal marketplace (Figure 5). 5 EyeEm offers features similar to Instagram, but with a more refined approach. Users can also sell images on the internal marketplace. The photos, video clips, and chats that you send with the Snapchat app are designed to be of the moment, rather than just a collection of good images you’ve taken. Plus, they are ephemeral, disappearing a short time after they have been viewed. Rather than an Instagram-like feed that you can peruse at any time, Snapchat is more of a texting and photo messaging service where you share things as they are happening. There is also a My Story feature, which is similar to Instagram Stories (in fact, Snapchat is where Instagram got the idea for its story feature). If you really want to embrace your silly side, you can add fun and whimsical extras to the photos you post, including facemorphing effects and add-ons such as cute animal ears and noses. You decide who to send your snaps to: you can send your snap or video to an individual, a group of people, or you can broadcast it to all of your followers. Once someone else views your post on Snapchat, it will expire (disappear) from their feed (but keep in mind that recipients can always take a screenshot of whatever you send). Many people use Snapchat as a way to connect to their followers on a more immediate, in-the-moment way than platforms such as Instagram and Facebook allow. When you post your images on social media channels such as Instagram, Twitter, and Facebook, you can extend their reach by making them discoverable through adding hashtag terms to the post. This involves adding a word (think of it as a keyword or search term) that is preceded by a hashtag, which is the pound symbol (#). The presence of a hashtag term with your post means that it will show up in the results whenever someone searches for that hashtag. For instance, if you find yourself exploring the photographic genre of street photography, adding #streetphotography to your post will make it visible to other fans of that genre who take the time to search for images with that hashtag (Figure 1). This will make your photo visible to an audience beyond your usual followers and could result in picking up new followers who discover your photography. Hashtags are commonly used to identify where a photo was taken (#santafe), the name of a specific event (#marchforscience), or even for humorous purposes (#notcomingbacksendmythings). Hashtags are also commonly used if you want your images featured in an Instagram image hub that is focused on a specific genre of photography, such as landscapes, animal photos, or views of a city. 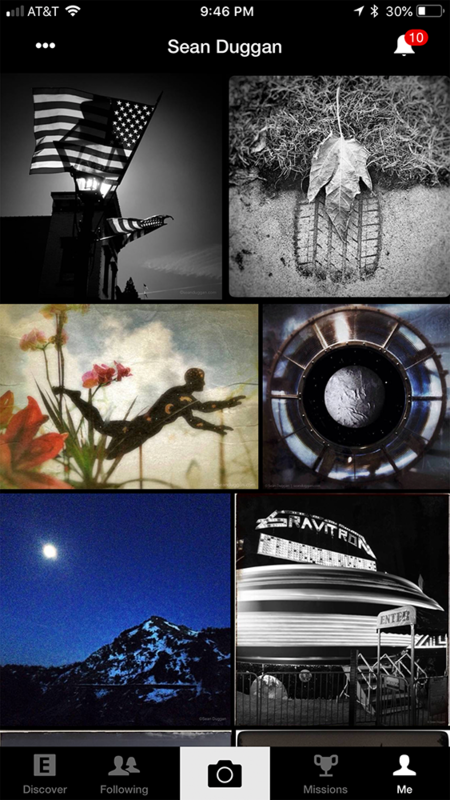 By adding the hashtag designated by the group, your image will show up as a submission, and the curators might choose your photo to be featured.